Saying sorry is, in general, a nice thing to do. 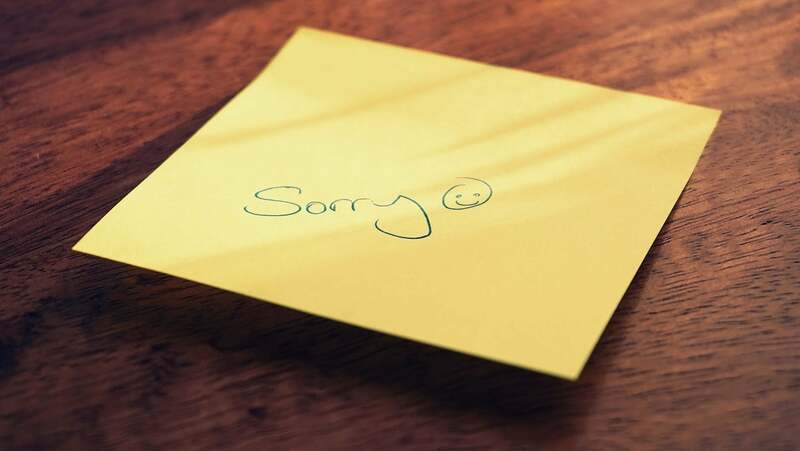 There’s recently been a bit of a movement to encourage people, especially women, to stop apologising so much. While I do agree that women, in general, tend to apologise more than they should, I don’t think we need to get rid of it entirely. Sometimes an “I’m sorry” is appropriate, other times, you’d be better off saying something a little different. This week Fast Company published a story where is talked about over apologising, specifically how it can undermine your authority and confidence in a situation, and ultimate damage your credibility or portray you as weak and indecisive, never things you really want. Also, when you’re constantly apologising, when that thing comes along that you should be apologising for, your audience will be so desensitised by all your other non-needed apologies that it can seem insincere. You don’t need to apologise for things like emotions or saying no. Instead, just explain what the problem is and offer a small followup to it. The key is taking a closer look at the things you’re apologising for and making sure they’re things you should be apologizing for. If something doesn’t actually require an apology (some things definitely do!) then think about how you’re phrasing your response to a person. It can have a dramatic effect on how you’re perceived. Sometimes you also get caught in the catch 22 scenarios where you don't say sorry but you are saying how you are going to fix the problem but then the person is like, what not even going to say sorry. Even better when you say sorry and then they say, well sorry isn't going to fix it, even though you just mentioned how you were going to fix it. Hair pulling moments 101. Don't we all love those pedantic pr**ks who try proving a point at your expense, but you can quickly put them back in their box, without publicly eviscerating them. "Sorry isn't going to fix it". "You're quite correct, the apology was simply an acknowledgement of error, and the activities I've just detailed will fix it. Did you have anything further to add to it, or are you actually saying that the activities just discussed are not a valid approach. I'm unclear on the point you are trying to make ?" "Why aren't you saying sorry ?" "Thank you for raising that point, I appreciate some people may have missed that by going straight into restoration of the issue, it was a tacit acknowledgement of error, and I felt the time was best spent rectifying the issue. Of course, we could now take some time out to say sorry first ? Which is more important to you ?" Said with a straight face, and a neutral tone, both of those responses should highlight to them the immaturity of what they've just said, and you might find the rest of the meeting goes without a peep from them. Of course, if it's an emotional issue, things get a tad more complicated.. If I were able to pull this off with a straight face, definitely be a mic drop moment haha.